Maj. Gen. John B. Morrison, Jr.
Camp Gordon was approved as the name for a WWII division training camp which began construction in July 1941. The U.S. War Department approved a contract to construct facilities on a new training area near Augusta, in Richmond County, Georgia that had been selected several months earlier. A groundbreaking and flag-raising ceremony took place in October. In response to the attack on Pearl Harbor Colonel Herbert W. Schmidt, camp commander, moved his small staff from his temporary office in the Augusta post office building to the unfinished headquarters building at Camp Gordon on 9 December 1941 and the 4th Infantry Division began to establish operations there. SP5 Lawrence E. Blackman (Darlington, SC) Hq & Hq Co, USASTC, receives the first typhus shot administered by a jet injector at Fort Gordon by Mr. John R. Gordon, representative of the R.P. Scherer Corp., Detroit, Michigan, August 1959. From early 1946 to June 1947, the U.S. Army Disciplinary Barracks for convicted criminals was located at Camp Gordon, and the installation was scheduled for deactivation. In September 1948 the Army relocated the Military Police School from Carlisle Barracks, Pennsylvania, to Camp Gordon, and in October 1948 a Signal Corps training center was activated. On 21 March 1956, the post was renamed Fort Gordon. During the 1950s and into the 1980s Fort Gordon served as a basic-training camp. It also provided advanced individual training for troops. Since June 1985 Fort Gordon has been the home of the Signal Corps Regiment, the branch of the U.S. Army responsible for providing and maintaining information systems and communication networks. The US Army Signal School's primary purpose is to conduct specialized instruction for all Signal Corps military and civilian personnel. During the Vietnam War, Fort Gordon was home to Camp Crockett, an area of the post conducting 9-week advance airborne infantry training courses for soldiers in line to attend the remaining 3 weeks of Airborne training at Fort Benning, Georgia, and then be assigned to Airborne units in Vietnam. The location closed as the war ended and today the site is overgrown with pine trees. Between 1966 and 68, approximately 2,200 Signal Officers were trained at Fort Gordon's Signal Officer Candidate School (OCS), before all US Army branch OCSs were merged with the Infantry OCS at Fort Benning. During the Vietnam War, Ft. Gordon was also a training location for the Military Police Corps, located in the World War II wooden barracks corridor between Brainard Ave. and Avenue Of The States, and in the Brems Barracks region of the fort (which was also later used in the 1980s for training radioteletype operators). In September 2014, the US Army established the US Army Cyber branch and Cyber School at Fort Gordon. Both the Signal School and Cyber School are subordinate elements of the US Army Cyber Center of Excellence, the headquarters which was formerly known as the US Army Signal Center of Excellence. The chiefs of the Signal and Cyber branches - the Chief of Signal and the Chief of Cyber - are dual hatted as the commandants of their respective schools and serve as the proponent chiefs for their branches and regiments. In October 2016, Fort Gordon marked its 75th year as a continuous active US military installation near Augusta, GA. The post also hosts a joint-service command, National Security Agency/ Central Security Service Georgia, formerly known as the Gordon Regional Security Operations Center. The Army's 706th MI Group works there alongside units from the 25th Air Force, Naval Network Warfare Command (Navy Information Operations Command, Georgia),  Marine Corps Intelligence Activity as well as civilians from the National Security Agency (NSA). Considered a mission partner on Fort Gordon is the Dwight D. Eisenhower Army Medical Center (DDEAMC) as well as a dental laboratory. The facility treats active duty military and their families, as well as many of the military retiree community in the Central Savannah River Area. Fort Gordon has approximately 30,000 military and civilian employees and currently has an estimated $1.1 billion economic impact on the Augusta-Richmond County economy. ^ Hudson, Paul Stephen; Mirza, Lora Pond (2017). 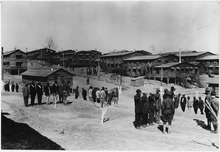 "Transforming the Atlanta Home Front: Camp Gordon during World War I". Georgia Historical Quarterly. 101 (2): 147–165. Retrieved 20 February 2018. 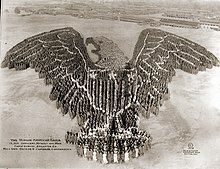 ^ Order of Battle of the United States Land Forces in the World War: Zone of the Interior Territorial Departments Tactical Divisions Organized in 1918 Posts, Camps, and Stations Vol 3 Part 2. (Center of Military History, United States Army, Washington DC 1988) pp. 821-822 and 826-828. ^ The New Georgia Encyclopedia, World War I in Georgia: Federal Installations and War Camps. Retrieved 2011-05-05. ^ Dunn, Mark (10 June 2005). "New Georgia Encyclopedia: Fort Gordon". Retrieved 8 February 2008. ^ "Vietvet.org". Retrieved 4 October 2014. ^ "NIOC Georgia History". NAVIOCOM Georgia. United States Navy. Retrieved 10 December 2008. ^ Gallagher, Matt (27 March 2018). "Army of 01101111: The Making of a Cyber Battalion". Wired. Archived from the original on 14 June 2018. ^ "Connect from Home: UofL Libraries". search-proquest-com.echo.louisville.edu. Retrieved 2 February 2018. ^ "The Army's cyber command facility with a Star Trek-inspired showroom may be falling apart". Washington Post. Retrieved 4 October 2014. ^ "Army Settles On Augusta For Cyber Forces Headquarters". nextgov.com. 20 December 2013. Retrieved 22 December 2013. 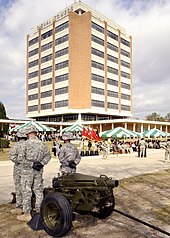 Wikimedia Commons has media related to Fort Gordon, Georgia. WW1 account of Life at Camp Gordon"Letters from Ward B Scripture of the 328th Infantry to his Mother during WW1"